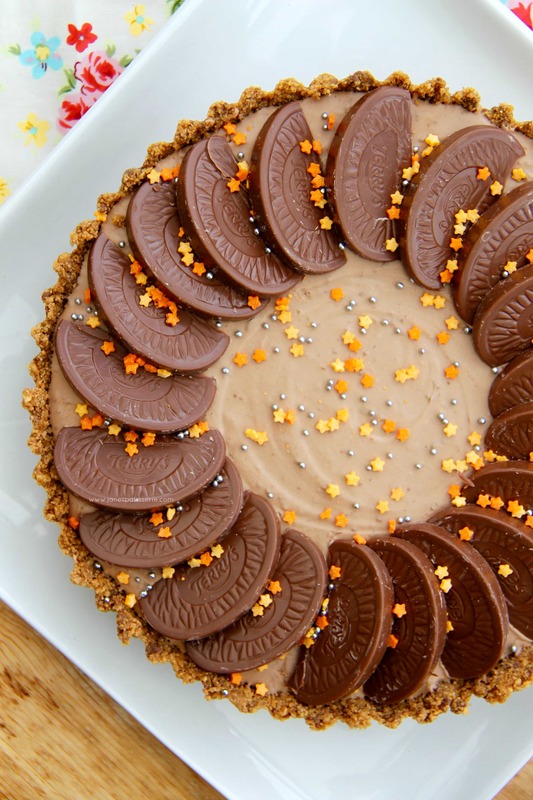 A DELICIOUS No-Bake Terry’s Chocolate Orange Tart – a No-Bake Crust, and a No-Bake filling… heaven! 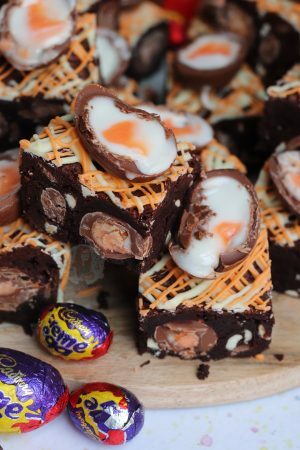 Obviously, I am obsessed with Terry’s Chocolate Orange… I now have SEVEN recipes dedicated to the delicious Chocolate that is all worldly and holy – but this one is SO easy to make, and so delicious to eat it is silly. 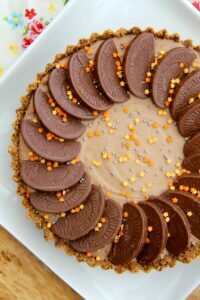 Obviously, one of my best successes so far is my No-Bake Chocolate Orange Cheesecake – its the second most popular recipe on my blog by far, and you all LOVE it! 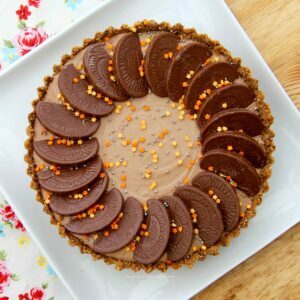 But this little beauty is for those of you who want something deliciously No-Bake, creamy, chocolatey orangey – but even easier than my cheesecake! It’s basically just the cheesecake, but without the cream cheese, but hey ho… it’s delicious. And definitely one for those who hate cream cheese! A few weeks ago I posted my recipe for my No-Bake Honeycomb Crunchie Pie and you all loved how easy it is, and how delicious it is. Even my boyfriend, who is equally as cheesecake obsessed as I am, LOVED that Pie. 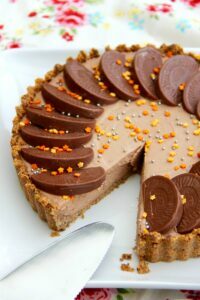 The method is very similar to it – a delicious biscuit crust, and a smooth, chocolatey and creamy filling that takes minutes to make – perfection. 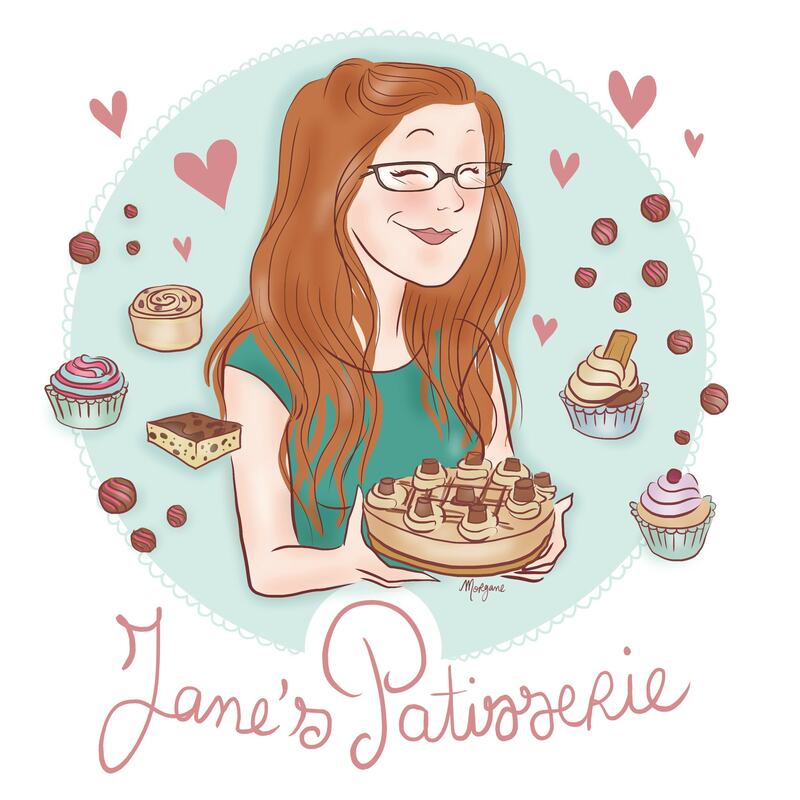 As I am currently on a Gluten-Free diet (Doctors attempting to find out what’s wrong with me), I use Gluten-Free Digestives for my base, and as everything else is already Gluten-Free I am dandy – but you can make the base with whatever biscuits you like! You could use Oreos like in my No-Bake Honeycomb Crunchie Pie, or you could use Graham Crackers or anything! The ideas are endless – and any biscuit would match the delicious creamy filling! 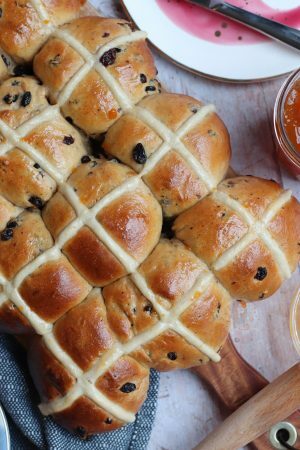 I realise that this dessert does look quite plain in comparison to most other desserts on my website, but that’s not necessarily a bad thing. Honestly, just blitzing all the biscuits in, whipping the middle up and slapping on a load of Terry’s Segments, and you have a simple yet DELIGHTFUL dessert. You can make any other flavours you want as well, but I stuck to Terry’s, because obviously. No-Bake Terry's Chocolate Orange Tart! A DELICIOUS No-Bake Terry's Chocolate Orange Tart with a No-Bake Crust and No-Bake Filling - heaven! Using a Food Processor, or a large bowl with a rolling pin, blitz your biscuits up to a fine crumb. Melt your butter, and mix it in till combined. Press into the sides and base of a 20cm Pie/Flan Tin - I tend to squish the sides in first, and then do the base of it. Chop the Chocolate up and melt in a bowl over a pan of simmering water - or in the microwave in short bursts on a low heat. Leave to cool slightly. Whip the Cream and the Icing Sugar up to soft peaks, I tend to use an electric hand whisk for this bit as I am lazy, but you can easily do it by hand with a bit of arm power. You don't want to whip the cream up too much, as soft peaks are best for folding in chocolate. 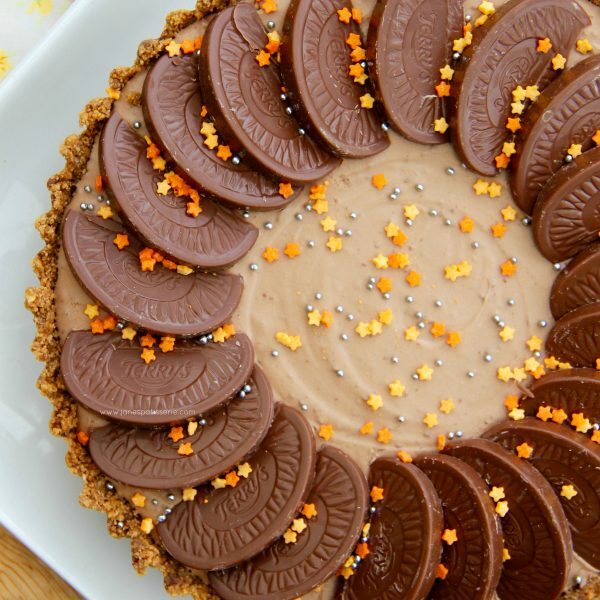 Fold through the slightly cooled Terry's Chocolate Orange, and then spread the mixture onto the biscuit base. I then add my Terry's Chocolate Oranges slices and sprinkles now so they set into the tart - but you can also do this after. Leave the Tart to set in the fridge for 5-6 hours, or overnight. 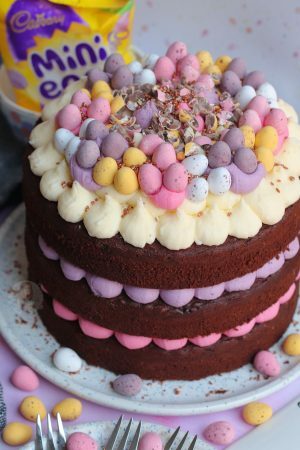 I nearly always use the Milk Terry’s Chocolate Orange as its my favourite, but there are so so so many types now you can use which ever you fancy! If you want a stiffer set, then don’t whip the cream up, stir in the liquid double cream and it’ll be less moussey! You can easily double up the recipe to make a bigger & deeper pie – add another half of the base recipe (I.e. use 450g Digestives, and 150g butter) and double the filling recipe! Use a 25cmx5cm deep tart tin! 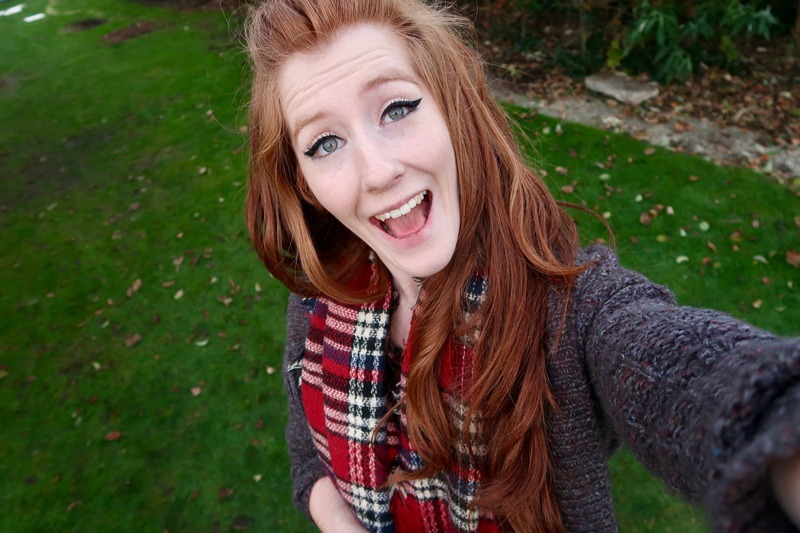 Older Next post: Christmas Yule Log! Newer Previous post: Chocolate Brownie Trifle! I want to attempt this but I’m worried about getting it out of the flan tin. Any tips? Most flat tins have a loose bottom, so if the sides are stuck, I carefully put a knife between the two bits of the tin from the underneath and push them apart – this is quite hard to explain… But, other times I just put the dessert on top of a tin, and carefully push the tin down, and then remove from the base! I made this for a family get together and it was really well received. The recipe was easy to follow and the end result was delicious! Thats amazing! However, I found your comment hurtful as well. Comments such as “don’t waste your time and money” and “this recipe is useless” aren’t fair to make, you could have just asked what could have been done, as thousands of people have made this successfully. Whip the cream up less next time, and combine slowly. Also make sure your chocolate isn’t piping hot, but not completely cooled either. I made it today for the second time! Looks lush and back of the spoon tastes delicious. Yummy. B&M stores are using your recipe on a video they have posted on Facebook. I recognised it because I’ve made it myself. Well yours looks amazing (which was why I thought I’d try it) and mine looked pretty good too. Plus my family all said it was awesome (which is why Im making it for Christmas Day). When I saw theB&M one I thought it looked like a poor version of yours and then checked the ingredients and it was the same!!!! Do you reckon it would work with after eight mints? Yes! I wouldn’t recommend melting the after eights for the filling, but you could use a normal chocolate, add mint extract, and decorate with the after eights. 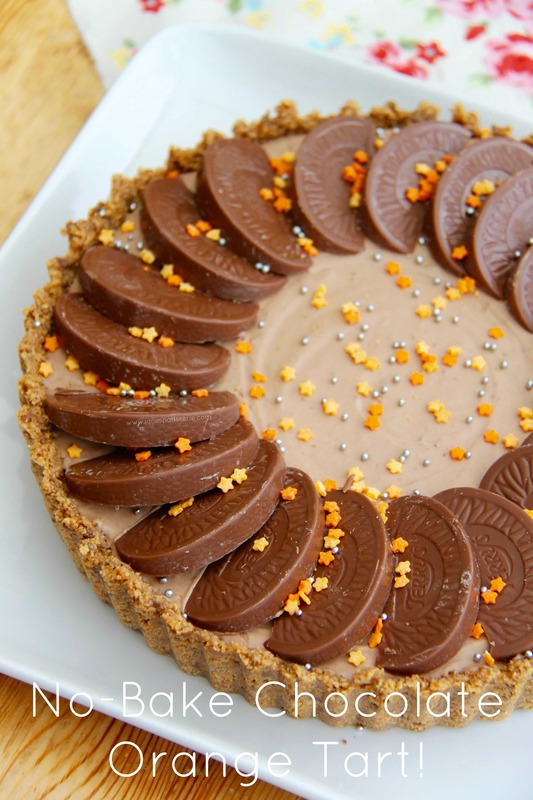 Can I freeze the Terry’s chocolate orange tart? Thanks. I did not understand a word of your recipe. would it be possible to translate it for the USA Market? 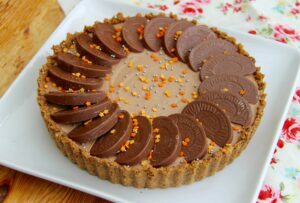 I want that tart so bad!! I can’t find Terry’s Chocolate Orange in New Zealand which is so sad! Haha. This looks delicious..and very fattening but what the hell, it is Christmas ! When using double cream and melted chocolate in a recipe, I put the chocolate pieces into the cold cream and heat them together. It saves washing up! I don’t do that with this as whipping the cream makes it more mousse like rather than a hard ganache 🙂 hence the recipe. Merry Christmas! I’m going to have to give this a shot one night before Christmas. Hope mine looks as fab as yours!